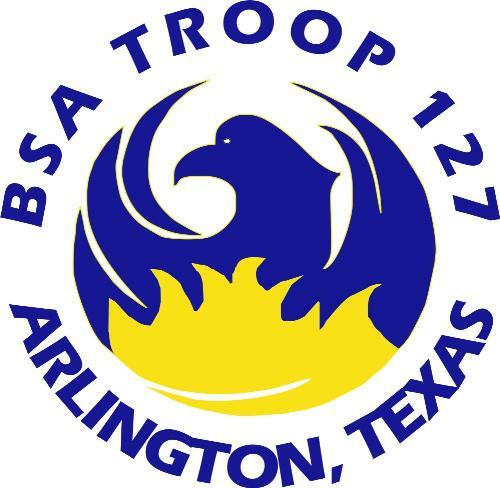 BSA Troop 127 was chartered on January 1, 1998 by St. Joseph Catholic Community in Arlington, Texas. Already the home of Girl Scouting and Cub Scouting, the Community felt compelled to make available the Boy Scouting program as an extension of its Youth Program. Born of a desire of five experienced Scouts to be a part of Scouting at it's finest, Troop 127 was established with aspirations to take the program to a higher level of excellence. Thus, they felt it appropriate that the phoenix, itself a paragon of excellence, represent the troop and that its slogan should be a moderate reminder of this yearning. Hence, Troop 127 is "Rising Above!" in all that it does. This core group of five quickly grew to a membership of 18 experienced Scouts. These 18 young men developed a program with a focus on excellence. Stressing fun, honor, character, commitment and uncompromising respect for others, the troop program that continues to exist today includes a strong advancement program, quality youth leadership, challenging outdoor experiences, and utilization of the patrol method to build future leaders. By the end of its first year, Troop 127 had grown to 26 Scouts, and had the privilege of honoring one of its founding members with the Eagle Scout Award. The ideals set forth in 1998 remain the core of our program today. Troop 127 has over 50 registered scouts and over 50 registered adults within our ranks. More impressively many of our adult leaders are registered merit badge counselors covering almost all of the offered Merit Badges. As of February 2013, 30 Troop 127 Scouts earned the distinguished rank of Eagle Scout. Our Scouts have visited the Philmont Scout Ranch three times within the last 6 years and we have 2 treks taking place in July/August 2013. Our Troop also participated in the 2010 National Jamboree in Fort AP Hill Virginia. The Troop maintains a strong and positive relationship with our sponsoring organization, St. Joseph Catholic Church. We support St. Joseph’s by providing assistance with the Men’s Club annual Fish Fry dinners and All Saints Festival. Our Scouts are active and like to maintain a full Scouting schedule. We camp nearly every month, taking time out in August to celebrate our success with a pool party. Please check our website for specific details on upcoming events and activities. Learning from each other, our boys reach beyond their own expected capabilities to master their self imposed limitations. Each is rewarded with personal triumph and success from a job well done. With a brief history so richly steeped in excellence, we have great expectations for the future of Troop 127.